Now, faculty and department associations are joining together with the Concordia Student Union in a new initiative hoping to bring out collaboration and dialogue between the different branches of student representation. 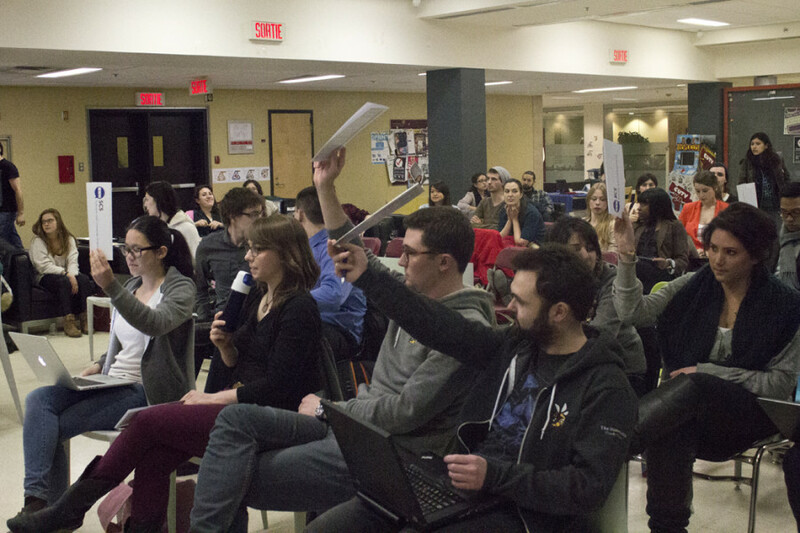 The Concordia Student Congress was in session last Thursday for its inaugural meeting, with 19 of the university’s roughly 30 associations present—representing all faculties, although only one fine arts representative was present. Like the United Nations, the student congress is an over-arching body to facilitate dialogue between governing groups, but its decisions are not binding. “I was honestly impressed by the caliber of the discussion,” said CSU VP Academic and Advocacy Gene Morrow, who helped spearhead the inaugural CSC. Among the decisions that were reached by the congress were propositions to “call upon student groups” to advocate for mid-semester evaluations of professors, for student consultation of budget cuts on the departmental level and to reevaluate and overhaul the university’s intellectual property policy. Morrow says the inspiration for the CSC came from seeing how other student associations across Quebec engaged with their constituents. “It was clear that other student associations had much more developed structures for developing mandates and positions and they really functioned—more often than not—from a position of knowledge of what their membership is about,” he explained. But while discourse was attained and ideas were shared, the resolutions passed by the CSC are merely symbolic. “The status of the decisions we just made, they have no existence in any actual institution,” said Morrow. Projects to Be Implemented, But How? Engineering and Computer Science Association President Antonin Picou—who brought forward multiple motions to the new political body—says the decisions of the CSC will be brought to ECA members for further discussion before any are implemented. Among the motions brought to the CSC by the ECA was the proposition to address students’ intellectual property on their own projects. Hipgrave added that this problem is something that affects students across faculties and should therefore be addressed by those faculties’ student associations. Following discussion, the final resolution adopted saw CSC members call upon the university’s vice-president of research and graduate studies, Graham Carr, to bring the revisions drafted by the working group currently examining the university’s intellectual property policy to faculty associations and the Concordia Senate—the university’s highest academic body—for consultation. Picou says the motions brought forth by the ECA stemmed from concerns the faculty association and its members thought would apply across faculty lines. “We brought up some issues we’ve had in engineering to bring them to the bigger picture of Concordia, and we brainstormed issues that we thought would be relevant to everyone so everyone could benefit,” he said. Similar to the ECA, Commerce and Administration Students’ Association President John-Michael Minon said CASA will let its members deliberate on the propositions before any are implemented. However, unlike the ECA, Minon says he has not heard of any of the propositions appearing on the agenda for CASA’s next council meeting. With the semester nearly over, Morrow says new meetings of the CSC will have to be put on the backburner. “I don’t anticipate calling another such meeting during this year—we have a few months left, exams are coming up, I doubt it will be propitious time at any point—but I don’t know, it seemed the people who came to participate appreciated it,” Morrow told The Link. “Hopefully we can try and convert some of—or, hopefully, most of—the positions that were advanced into concrete action; I think it would really help to further the pertinence of [the CSC],” he continued. But while he hopes his successor at the CSU can continue the CSC, Morrow says the format is open to all student representative groups at Concordia to continue building consensus. CSU President Melissa Kate Wheeler echoed the sentiment. “The CSC was a beautiful example of how student groups can build a community for students,” she said. UPDATE: An earlier version of this article stated Allie Hipgrave is the ECA’s VP Marketing. Hipgrave was the association’s VP Marketing last year. The Link regrets the error.